Or not so much, if you look at the thermometer, it’s rather chilly this weekend. I actually have a card I put together as a thank you. The background took all of 30 seconds and a few Copic Markers. The bottom is E37, to look like sand along a beach. Then I airbrushed layers of blues, starting with the lightest, B21 and layered horizontally increasing the colors, B23, B26, B29. 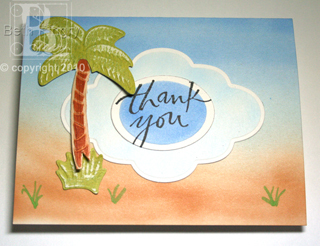 The palm tree is a retired Spellbinders™ die template. I cut the trunk from thin balsa wood, trimmed it with scissors so I just had the trunk, then used E37 to color through like a stencil. The leaves and grass are Core’dinations paper, cut/embossed and sanded. I used SCRAPBOOK ADHESIVES BY 3L™ 3D Foam Squares (I cut the smaller sizes in half while still on the backing) to fit on the back side of the trunk. For the Labels, I stamped the Thank You, then lined up a Classic Oval to cut/emboss, then airbrushed B24 while the paper was still in the die template, so I had the while border. Then I did the same with the Labels Six, but airbrushed with B21 and used the 3D Foam Squares to elevate the Thank You die cut. I added some sprigs of grass with G07. I should have made several of these, it was super quick and fun! This entry was posted in Card, cards, Copic, SCRAPBOOK ADHESIVES By 3L, Spellbinders, Uncategorized and tagged Beach, Copic, Nestabilities, Spellbinders, Thank You. Bookmark the permalink. Love the airbrushing and embossed palm tree!! !